This photo was taken just after 11am as we entered the Alaskan ice fields, last year, on June 27, 2014. 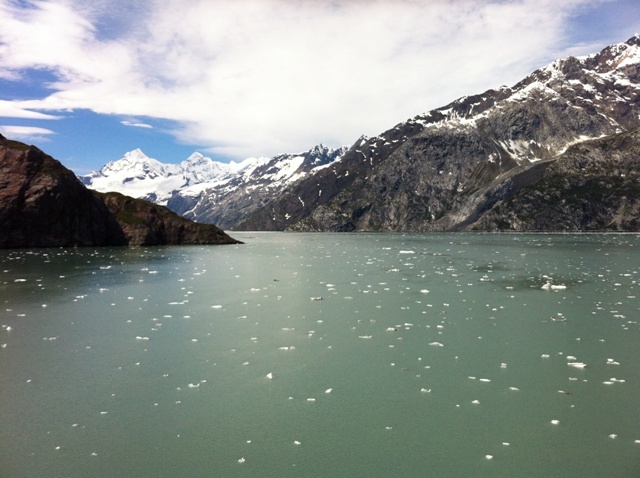 The day felt like winter as we were served hot pea soup on the deck as we watched the glacier calf. I think the picture would have been more effective if it had also showed the glacier as it is hard to tell that it is ice floating in the water without it. However, I do like this picture with its cloudy blue sky and icy blue water framed by the mountains. My sister spent most of the day outside watching the glacier. She got to see it calf. I did not. She said it made an amazing noise. No regrets. That’s the motto I try to live by. Alaska looks beautiful. Thank you for sharing this gorgeous image.